2 Is a Soft Crate the Right Option for Your Furry Companion? 3 Why Should You Buy a Soft-Sided Dog Crate? Are you showing enough love and care to your furry friend? Today, there are several different ways to express just how much you love your pooch but being able to take your fur baby wherever you go is one of the surest ways to make him feel special. Since dogs are considered to be a part of the family, it’s okay to take them with you everywhere regardless of whether you’re heading to the store or going on a vacation. However, you should know that it’s also crucial to keep your pet comfortable and safe while going from the store to the park or some other place that tickles your fancy. This is precisely where the best soft dog crates come into play. You need to get your hands on a beautiful crate, more like one that stands out from the rest of the market. It’s important to note that soft-sided crates may not be like other dog crates that you’re used to. So, it’s in your best interest to know as much about them as possible to make sure they’re perfect for your pooch. A soft-sided dog crate is simply comfortable, versatile and lightweight alternative to a regular crate. Essentially, it makes it incredibly easy for your furry buddy to crated safely when the both of you decide to head out of the house. The good thing about these crates is that they’re more accessible and perfect for nervous or anxious dogs. Moreover, since these small kennels are made of soft materials, you can be sure that your pooch won’t get injured regardless of how hyperactive he is. This is one thing that sets them apart from metal crates. Is a Soft Crate the Right Option for Your Furry Companion? The very first thing you should know is that soft crates are great, but they may not be the best solution for every dog. Since you know your dog better than anyone, it’s up to decide if soft-sided crates will work for him or not. So, it’s critical to get a better understanding of your furry friend’s personality and understand some of his traits before taking the plunge. For starters, a soft-sided crate may not be the best option for pet parent who owns aggressive dogs. What you should know is that even the most quality or durable ones on the market can be easily clawed or chewed by stubborn or larger dogs who want to enjoy the great outdoors. So be sure to check how aggressive your dog is before making a decision. If you find that your dog is nervous, be sure to check whether the crate calms him down or make him more anxious. If a metal or plastic crate didn’t go well with your pooch, then there’s a good chance that they won’t be happy with a softer one, but there’s no harm in getting one to see how things unfold! Finally, the best soft dog crates are excellent for road trips regardless of how long or short they may be. You can use them wherever you go and are sure to give your pooch the opportunity to have a small taste of home on the go. It’s important to note that you may need to consider another type of carrier if you’re going to be traveling by air. Why Should You Buy a Soft-Sided Dog Crate? Most dogs are sure to love soft-sided crates primarily because they’re comfortable. There’s a good chance that your pooch will love to have one. 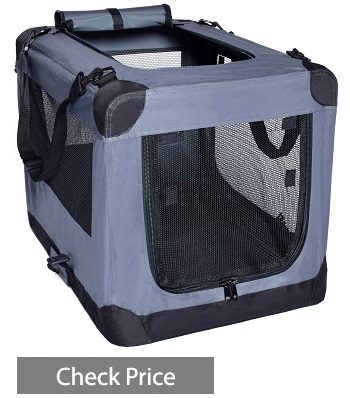 With a soft-sided crate, your dog will go with you to more places and enjoy your company. The good thing is, you also get to benefit from these products because they’re durable and easy to store away when not in use. The best part is, such crates will prevent your pooch from getting injured while on the go. All in all, if you’re a pet parent who loves to take your fur baby with you wherever you go, then you may want to get your hands on a soft-sided dog crate. The good thing is, your pooch will enjoy spending time with you, and you’ll also have peace of mind knowing that they’re safe! It’s more like a win-win for you! 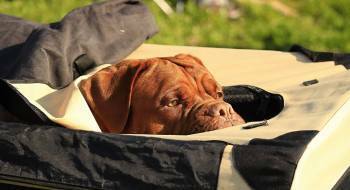 So are you ready to get a super comfortable travel gear for your pooch? We’re pretty sure you are! The very first thing you should know is that the market for soft dog crates is saturated with products from several different brands, making it difficult to pick the best for your furry friend. The good news is, we’ve taken it upon ourselves to research and create a list of the best soft dog crates that are sure to fit your dog’s needs and give you the best value for money. Now, you’ll get to avoid all the bad products and get only the good ones! Here are the five best soft dog crates in 2019! The first product on the list is the K&H Classy Go Soft Crate. It’s a large soft dog crate that comes with enough room to accommodate your furry buddy. 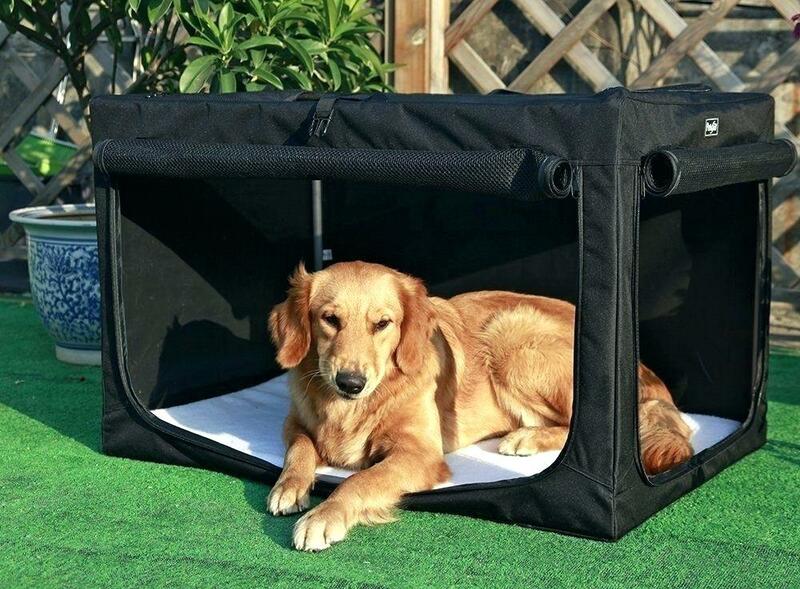 This is one of the best soft-sided crates that’s sure to work great for pet parents looking to take their large dogs around. The good thing is, the crate is made of high-quality material so you can expect it to last a long time. It’s also good to point out that the crate come in several different sizes, so it’s sure to work great for different breeds. It also comes with two points of entry for your furry companion. The crate also has mesh windows on all four sides. Moreover, the K&H Classy Go Soft Crate features a fleece pad, so there’s absolutely no need to buy an additional crate mat. It also has pockets and a storage pad. The best part? The crate is very easy to assemble — you can expand and collapse it in a snap! You can also choose to break it down for super easy transportation! What more could you ask for? The Arf Pets 3 Door Folding Soft Crate is yet another soft-sided dog crate that deserves to be on our list. It’s one of the best soft dog crates that can easily accommodate dogs weighing up to 70 pounds. 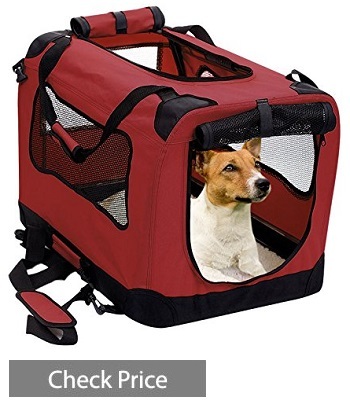 The good thing about this product is that it comes with doors on the side, front and top, making it super easy for your pooch to enter or exit the crate. These entrances also allow for plenty ventilation, and that’s great. It’s also good to point out that the Arf Pets 3 Door Folding Soft Crate is built to last thanks to its heavy-duty frame, waterproof base, and washer-friendly material. You’ll also love the unique folding design of this soft dog crate — it makes it super easy to assemble and collapse. All in all, this is one of the best soft dog crates for the money — don’t hesitate to get your pup in it! Are you looking to little pooch with you when heading out? 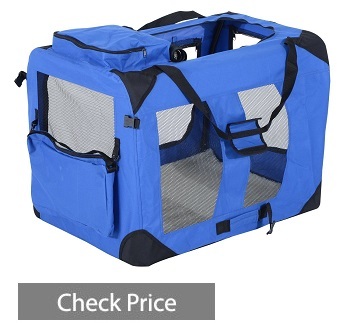 If yes, you should check out the 2PET Foldable Dog Crate. This is one of the best soft dog crates that comes with an attractive design that opens from the top or front. It’s good to know that the crate is available in several different sizes ranging from small to extra large. 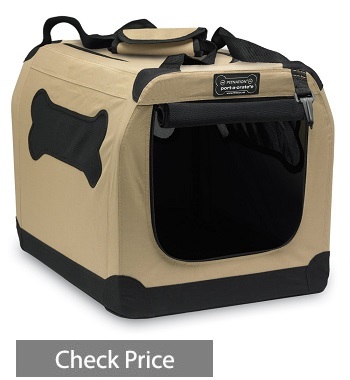 For the most part, this soft dog crate is covered with soft, water-resistant Oxford 600D fabric cover that you can easily remove and wash at will. Moreover, the 2PET Foldable Dog Crate features large windows that are made of mesh panels, making it perfect for dogs that love viewing the great outdoors. Moreover, the windows allow for excellent ventilation. To sum it up, the 2PET Foldable Dog Crate includes a waterproof mat and a washable fleece cushion. You’ll also be glad to know that the company donates a portion of sales to pet shelters! Isn’t that amazing? Very few complaints about the crate’s zipper. Next up is this soft dog crate that comes in three sizes making it perfect for different breeds. The Pawhut Soft Sided Folding Crate also gives you options for customization as it comes three colors including red, khaki and green. It’s good to know that this soft-sided dog crate uses is made of Oxford material with PVC coating which also happens to be water-resistant! That’s not all — the crate’s cushioning is made of faux lamb cashmere so your pooch can be super comfortable. The Pawhut Soft Sided Folding Crate also comes with three doors coupled with three windows for better ventilation. The model also features several side pockets which you can use to store your pooch’s treats and stuff. Overall, this is a great pick that’s sure to get the job done. Last but not the least is this budget-friendly option that’s sure to get the job done. The Petnation Port-A-Crate E2 comes in a variety of sizes ranging from 16 inches to 36 inches — you can be sure of finding the right size for your pooch. The crate’s steel frame is covered with heavy-duty tight weave mesh fabric that’s waterproof and very easy to clean. It’s also good to know that the crate has mesh windows coupled with doors on the front and top. Another good thing about this brand is that they provide pet parents with a measuring to ensure they choose the right size for their pooch. All in all, this lightweight, soft dog crate is one of the best picks for the pet parent on a tight budget — it’s sure to get the job done! Do you want to get the best value for money from your purchase? If yes, you need to consider a number of critical factors before taking the plunge. This section is going to explore several different things to consider to ensure that your chosen soft dog crate is the right fit for your four-legged friend. The very first thing you should consider is the size of your dog. 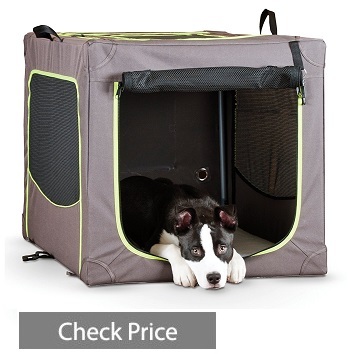 There’s no point buying a crate that won’t be able to accommodate your pooch comfortably. You need to get one that will be long, wide and high enough to provide all the comfort your dog needs — this is crucial. It’s also an excellent idea to pick a well-ventilated crate so your dog can lead a super healthy life while on the go. When we talk of ventilation, we’re referring to the number of doors and windows on the crate. Failure to consider this will affect the health and well-being of your furry friend. It’s also recommended to consider the weight of the soft dog crate since you’re going to be carrying it with you every now and then. In other words, you need to get a lightweight or travel-friendly soft dog crate so things can be a whole lot easier for you. It’s so important to take a look at the material used in designing the dog crate. For the most part, the durability of the unit actually depends on body material quality. Just be sure to check the mesh fabric and metal tubes as they both happen to be essential parts of a quality dog crate. It’s also good to check the finishing work, zipper work and the entire body of the soft dog crate. So there you have it! With all that has been said, you can agree with us that the best soft-sided dog crate is sure to be a great addition to your dog’s accessories. See also: Should I crate my dog at night? The best part is, you won’t need to go through the hassle of finding the right crate thanks to the five top picks on our list. All the products on the list are made from high-quality material and sure to last a long time. Moreover, they’re lightweight, comfortable, portable and available in a variety of sizes! What more could you ask for? SmartDogLover.com is a participant in the Amazon Services LLC Associates Program, an affiliate advertising program designed to provide a means for sites to earn advertising fees by advertising and linking to Amazon.com. Smart Dog Lover Copyright © 2019.